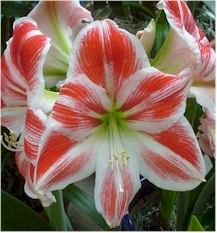 This candy-striped amaryllis will stay in bloom for up to two weeks if kept in slight cooler conditions. First, see Stage 1 Amaryllis care to learn how to get your Amaryllis to the blooming stage!Once the Amaryllis flowers start to open, be sure not to move your plant around too much. Long flower stems can cause the pot to tip over. Stakes will keep the stalks from bending and tipping the plant over, as they often do when top-heavy with blooms. Amaryllis bulbs also tend to twist towards the light and that can cause eventually cause the pot to tip over. The stem is hollow and will snap easily and that will be end of your flowers. We strongly advise placing the plastic pot in a larger clay, or ceramic cache pot, for stability. While your amaryllis is in bloom, keep it well watered, and in a relatively cool spot (at least 65 degrees) and out of direct sunlight to ensure that the blooms last as long as possible. You can remove the blooms as they fade, usually one at a time. When all the blooms have faded, you can allow the stem to wither naturally, or if your plant is indoors and you find the stem unattractive, cut it off at the base with a sharp knife. Do this near the sink as there is often sap that will run out of the hollow stem. Amaryllis blooms also do well as cut flowers-remove the stem from the plant just as the buds are beginning to open and place them in a vase. Some florists will stuff the base of the hollow stem with a paper towel before placing it in a vase to help with water uptake .